The Gift of Positive Training. Proving what a perfect boy he’s grown up to be, Leo lay down and waited while we set up for our Christmas photo shoot. Sept. 8, He barked at two bikes coming from opposite directions and an off-leash dog. Barely registers on the reactivity scale. A dog barks at an off-leash dog? Who wouldn’t? June 7, We had a particularly challenging walk and he barked and lunged at a bicycle after successfully NOT barking at a bunch of other stuff. 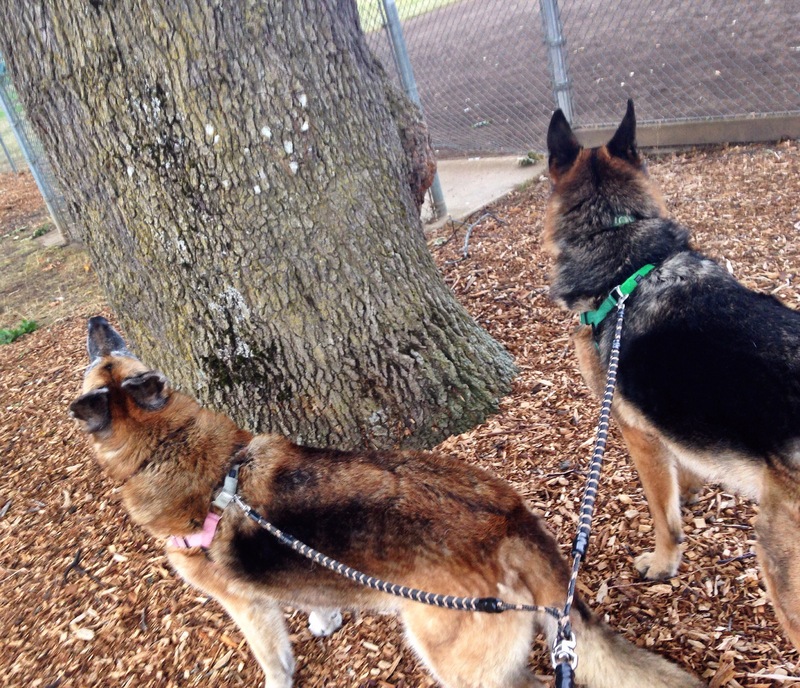 That’s two leash-reactive incidents worth reporting in the past six months. What it’s shown me is that success begets more success. It can be hard to wrap your head around when you’re in the thick of reactivity. While trying to get Isis to accept Leo, we had what I considered a debacle where the dogs played for a few seconds for the first time ever … and then got into a fight. Me and Isis in front of our chosen tree in Dec. 2010. At the time, I thought, Yeah right. How are they ever going to forget hating each other? Sadly, they never had the chance, but six years later, I’ve seen the concept realized: repetition leads to habit. Example: Leo barks at bicycles from the car. Unchecked, he’d develop a habit of doing this, so he’d get in the car, expecting to find things to bark at. We got him out of this habit by using a Calming Cap. Now, if we forget to put it on him, or if he takes it off himself (sneaky bugger), he’s not searching out the window for things to bark at. We have to be careful they don’t backslide. On a recent solo afterdark walk with Leo, I noticed a flashing light behind me. Good thing too, because it gave me time to ready the cheese. Leo didn’t react to that bicycle as it passed, but the next time we encountered an unrelated flashing light, he flinched, expecting it to be something scary. The gift I want to give fellow people with reactive dogs is: Have hope. Work to have more successes than failures. You will see improvement. Leo’s gotten so good, that a few times recently, he has seen a trigger across the street before I do (because it’s dark). I’ll feel him tense up on the leash and then he whip his head back to me. Hey, did you see that? I’m supposed to get cheese now, right? Yes, my darling boy. You get all the cheese. This month, our generous blog hop hosts are giving away some positive training goodies! Click here for the Rafflecopter. Join the Positive Pet Training Blog Hop! Hosted by Tenacious Little Terrier and Rubicon Days, the hop begins on the first Monday of every month and runs all week long. I’m thrilled to announce that Rescue Dogs, an excerpt from my work in progress, has been published in the University of Washington’s Stratus: Journal of Arts and Writing. I’ve been working on Fight Like a Lady since 2009 (it started as a NaNoWriMo book! ), although not steadily: I wrote Bark and Lunge during that time. It’s so close to being done, and I can’t wait to share it with all of you. More about Fight Like a Lady.
. . . one can never give too many food treats during temperament training exercises . . .
A few weeks ago I received a very nice message from someone who had heard my two podcasts on The Great Dog Adventure with Fern Camacho. (This one and that one) She related to my struggles with Leo, because she has a reactive dog too. I never leave my home with out a pocket full of treats. Now when we see a dog, he turns to look at me to get a treat. I was wondering with your training of Leo, have you gotten to the point where you can wean Leo off of the string cheese? I am thinking that once a behavior is reinforced for a period of time, you no longer have to reward it. I told her that I do still carry string cheese on all our walks. I’ve been doing it for two years, and the thought hadn’t crossed my mind to try to phase it out. Ever. I’m totally okay with buying two large bags of string cheese every time I go to the store, and peeling the plastic off about twelve sticks before each walk. I went from thinking we’d never be able to walk Leo past a bicycle to having him look to me for cheese before I’ve even seen the bicycle. Now, even if he barks, he calms down pretty quickly. For example, recently I spotted a bike coming our way. I crossed the street and readied the cheese. Then another bicycle came from the other direction, with an off-leash dog running beside it! Leo was amped, but not barking, and I don’t think he would have if I hadn’t made the tactical error of positioning us next to a dude rummaging inside a sketchy van. I got distracted wondering what that guy was going to do, and Leo wound up barking at one of the bikes. Who cares. There was a time this would have ruined my whole day. Whatever. Back to the question from my listener, though. She asked whether once a behavior is reinforced, you can stop rewarding it. The biggest mistake reward-based and positive-reinforcement trainers make is to not phase out food soon enough. A lure takes a willing dog and tells him what we want him to do. A bribe coerces an unwilling dog to act against its will. The difference is, I’m not using the string cheese as a bribe, lure, or reward. I’m using it to counter-condition him to things that scare him. That’s why I give him cheese even if he barks at the trigger, because I’m not as much rewarding him for not barking as I am conditioning* him that bicycles (or whatever) mean good things. That’s why comforting a frightened dog (or human infant) doesn’t reinforce the fear. Fear is not a behavior. In addition to their obvious applications in all aspects of teaching manners, food lures and food rewards may be more importantly used for behavior modification and temperament training. In fact, food lures and rewards are so effective, their use should be mandatory. *So, shouldn’t Leo be conditioned by now? He’s getting there. When he sees something scary, he knows he’ll get cheese. And he has a much higher threshold for his triggers than he used to. Last weekend, we sat in the middle of baseball field while Rob practiced flying a drone, and Leo lay down very calmly. Bikes passed by on a nearby trail, at quite a distance, and he didn’t need to be cheesed. Leo’s the one chilling on the left. You will need to continue to practice DS/CC (desensitization and counter-conditioning) and positive reinforcement of the alternative behaviors you have taught in new situations and locations in order to help your dog generalize the context. This will get easier and easier as your dog’s emotions change and his new behaviors are reinforced. As your dog becomes fluent in these new behaviors, you will be able to decrease the amount of food rewards you give him and use life rewards instead; these are things your dog finds intrinsically enjoyable, such as jogging a few steps with you, play, praise and sniffing interesting smells in the environment. I still carry the cheese, because I can’t control the environment. It comes down to generalization. Leo could be completely desensitized to a 25-year-old woman traveling in our same direction on a bike at 37 feet away, but not to a 15-year-old boy traveling toward us at 26 feet away. Factor in speeds, and number of triggers he’s already seen that day… well, the cheese keeps him from barking most of the time. This is part of the Positive Pet Training Blog Hop hosted by Tenacious Little Terrier and Rubicon Days. Please share your responsible pet owner positive pet training tips by linking a blog post or leaving a comment below. Our theme for this month is my positive training journey but any positive reinforcement training posts or comments are also always welcome. The Positive Pet Training Blog Hop goes all week long. Our next hop will begin October 3rd and continues for a week. The theme for this month’s Positive Pet Training Blog Hop is Unconventional Training. Even though I look strange squealing “cheesy” at my dog when strangers walk, run, ride, or roll past us, I don’t think my String Cheese Method is unconventional at all. Reward-based training, to me, is the most basic, obvious method of training anyone to do anything. And yet, we still see prong collars and shock collars and people who think screaming at a stressed dog will de-escalate the situation. Until last week when a jogger zipped around a corner at us. And I was doing the worst thing ever. I was distracted by Pokémon Go. (Shout out to ZoePhee for finding a way to use Pokémon to aid in training, not distract from it!) Fortunately, Leo was also distracted … by peeing. I saw the jogger before Leo did and I said Cheesy and Leo didn’t bark! It was glorious. On tonight’s walk, he saw a couple of bicycles, and not only did he not bark, he didn’t even seem stressed. At the risk of repeating myself: Reward-based training works. If only there were a training guide to help people with reactive dogs who have been getting the wrong memos. Trainer Annie Phenix’s best-selling book The Midnight Dog Walkers has answers to questions I didn’t even know I had. As soon as I heard the title and saw the cover, I knew this was the book I needed when I struggled with my first reactive dog Isis. My book about her, Bark and Lunge, is the story of what happens when owners follow “conventional” (old-fashioned) training methods. Now that The Midnight Dog Walkers exists, my greatest wish is that positive, reward-based training becomes the obvious, conventional solution for reactive dogs and their people. The Positive Pet Training Blog Hop is hosted by Cascadian Nomads, Tenacious Little Terrier and Rubicon Days. Any positive reinforcement training posts or comments are welcome. Linky List open through Sunday.